It was only a matter of time before Dwight Freeney’s name resurfaced with NFL teams and that time came on Wednesday. With the Chargers losing former first round draft pick Melvin Ingram to an ACL injury, the need is there for an edge rusher. Freeney’s visit to San Diego is scheduled to run through today as the possibility is there for him to be reunited with former Colts Vice President of Football Operations and current Chargers General Manager Tom Telesco. In a recent interview Kuharsky had with Colts head coach Chuck Pagano, the topic came up of Vick Ballard as the top running back for the Colts. Pagano knows the benefit of having a couple of change the pace type backs and the coach also broke down what Ballard and fellow 2012 starter Donald Brown bring to the table. The popular Pro Football Talk has moved onto the AFC teams in accepting nominations for Mt. Rushmore candidates with the Colts the first team up. Florio writes that the four players can be chosen from the Baltimore and Indianapolis era with John Unitas and Peyton Manning being two of the obvious choices. The final four will be revealed on NBC Sports Network sometime next month. 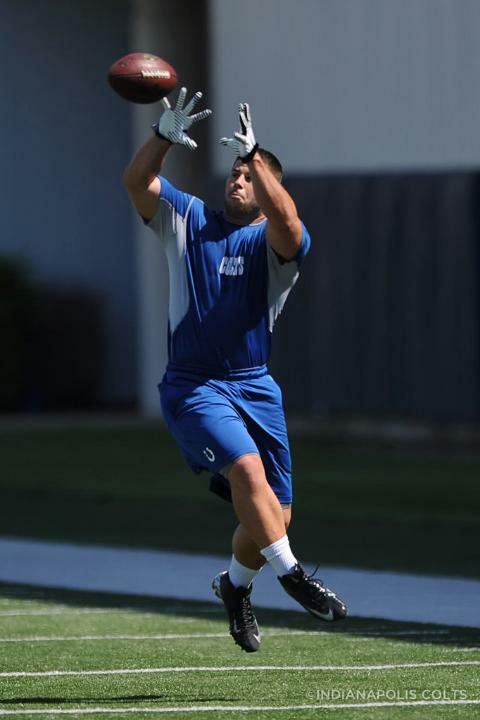 As 37 players took the practice field last weekend for the Colts rookie minicamp, colleges at all levels across the United States were represented. From Maine to Oregon State, schools were covered coast-to-coast and at every level with Marian (NAIA), Southern Connecticut (Division II) and Wagner (FCS). Two pairs of teammates took to the indoor practice field and while the Kansas State duo of Nigel Malone and Allen Chapman were busy earning a BCS bowl, it was the Montana Grizzlies who also sent two former players to Indianapolis. Wide receiver Jabin Sambrano was a training camp participant last year for the Colts and he returns this year to try and earn a spot on the final roster. While Sambrano is worried about his own chances at cracking the 53-man roster, he has also taken a leadership role in helping out former teammate Dan Moore. Listed as a running back on the Colts roster, Moore worked primarily as a fullback during the team’s three-day rookie minicamp this past weekend. Moore showed off his ability to be a threat in the passing game and that it is just one of a number of things the Tucson native feels he can bring to the Colts. With the resumption of OTAs earlier this week, Moore has another fullback on the practice field in Stanley Havili. Colts offensive coordinator Pep Hamilton has talked about the need to get pieces on the field who bring multiple attributes to the offense. This includes the fullback position and Moore is just fine with hearing that. “Running in between the tackles is there but they spread it out and throw the ball too so it’s real versatile for the fullback,” Moore said. Dan Moore catches a pass at Wednesday’s OTA workout.